Wow, so it’s 2019! 2018 was quite a big year for me in some ways (like being pregnant), in others quieter (like having less energy to do things due to being pregnant). Although I let the Bullet Journalling habit slip a bit towards the end of the year, I’ve decided to keep going with it into the next year and (hopefully) after having this baby! I’ve been using one since 2016, which I’ve written about over here. People using this system modify it to suit their needs, whether it’s adding fantastically beautiful and detailed illustrations, colours and spreads, or simplifying it further by dropping some of the default stuff. The way that I use mine has evolved over time, and definitely falls more on the simple and lazy side of things. I’ve tried a few times (including the past week) to get a bit fancier and a bit more finessed, but I’ve once again come to the conclusion that that isn’t really my thing. My spreads sometimes include a bit of calligraphy or lettering, and the odd sketch, wireframe or mind map, but they don’t have anywhere near the polish of the ones I see on the popular #bujo Instagram feeds that I admire. But I’ve decided I’m okay with this – my journal is a space for rapidly logging and drafting events, ideas, plans and reflections. The ‘final product’ that comes out of this tends to be done elsewhere, drawn on the iPad or painted on more appropriate paper; coded into a website or fleshed out into a talk. For me at least, a focus on polish would hinder the freedom and spontaneity of this capturing and drafting stage. One thing I have decided to spend a little time on is labelling the journal cover and spine using gold foil. It’s taken me a bit of trial and error to get to this point, but for a once per year effort I’m loving the effect. 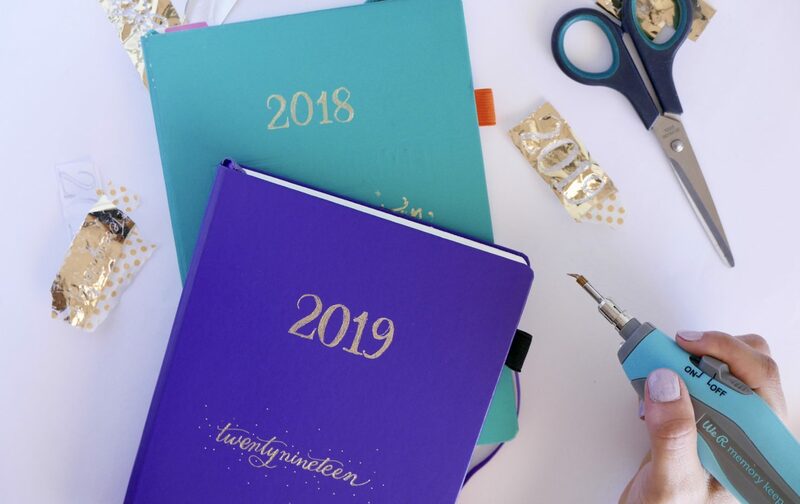 Are you using a bullet journal or other analog system this year? I’d love to hear about it!